Joining the Army and playing AFLW football are two things that Craftsman Rheanne Lugg always had in mind. Now the 28 -year-old apprentice electrical engineer is able to do both, thanks to the intra-state support of the Australian Defence Force. 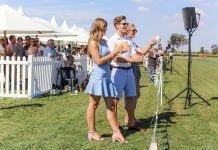 Growing up in a football family – father, Gary Lugg, played briefly for St Kilda and was the groundkeeper at Subiaco Oval – Rheanne played women’s football in her hometown, Perth, while completing a four-year electrical apprenticeship. 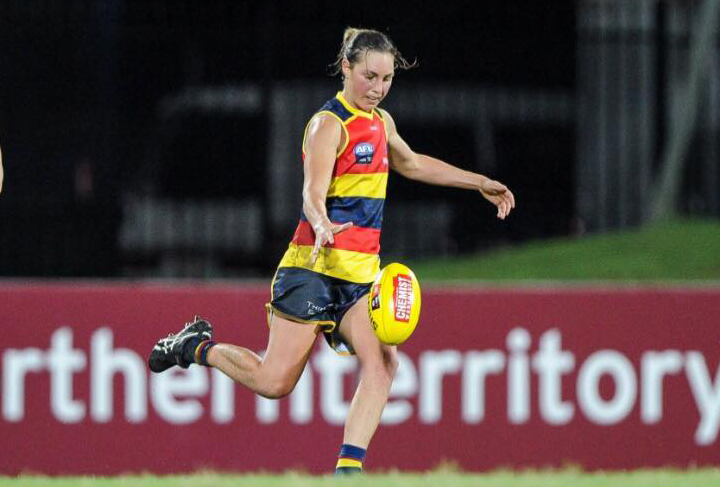 Rheanne Lugg, with the Adelaide Crows AFLW. 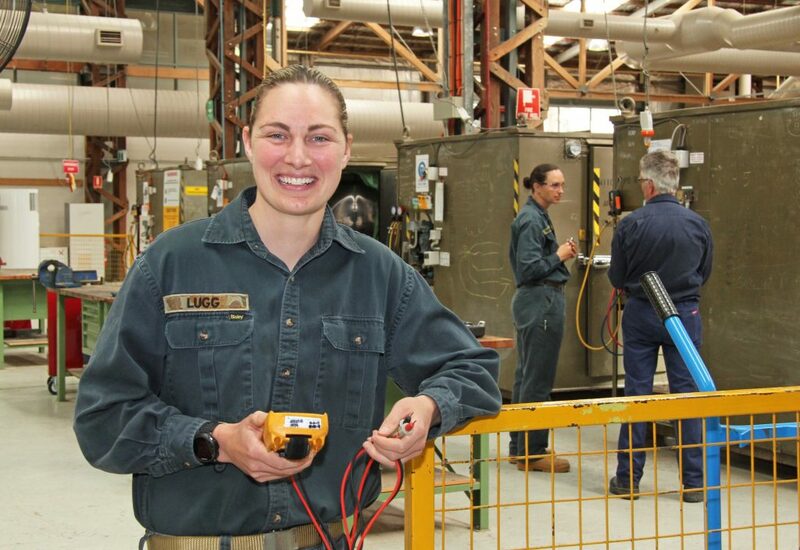 When it was time to make the next move, she decided to build on her technical skills and establish a career in the Army, enlisting to the Royal Australian Electrical and Mechanical Engineers (RAEME) as a 418 Technician Electrical. She is posted to the Army School of Electrical and Mechanical Engineering (ASEME) at Wodonga’s North Bandiana Barracks. “I’d heard good things about the Army and it’s a good, secure job,” Rheanne said. “Plus you get paid to do sport before going to work and you get paid to go to the gym,” she said. When Rheanne first enrolled, she was one of only two female apprentices, but this number has grown to around 15. The Technician Electrical apprenticeship focuses on the repair and maintenance of refrigeration, generators, air conditioning and occasionally auto mechanics, supporting the broader operations of the Australian Army. Last year Rheanne was talent-spotted by the Adelaide Crows AFLW while playing on weekends for the Riverina Lions based in Wagga Wagga, the nearest team at the time (her home club is now the Wodonga Raiders). 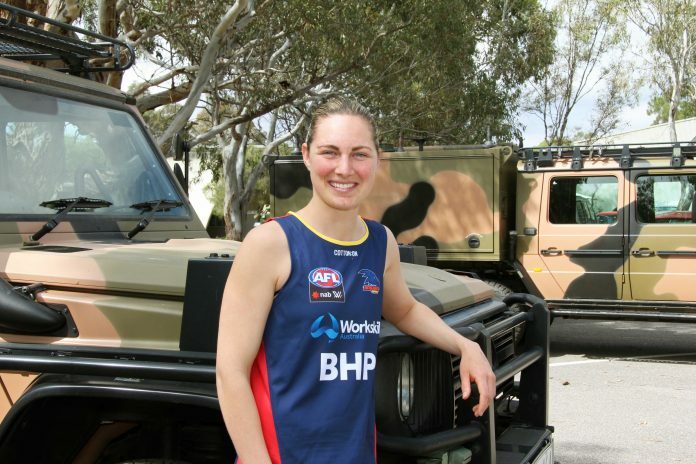 Although the star wing player regularly drove from Wodonga to Canberra to play in local competitions, which required a 3am start, commuting to Adelaide to train and play for the Crows for the AFLW season would have been impossible without the support and ability for Army to develop a modified training program. Through a coordinated effort by ASEME military staff, Rheanne was able to be temporarily assigned to the ASEME Adelaide detachment at the Royal Australian Air Force Base at Edinburgh, north of the city. This allowed the flexibility to play both elite sport and complete technical training units required for her Army apprenticeship. Next year will be the second consecutive year that Rheanne will represent Adelaide Football Club in AFLW, one of four women currently in the ADF who are supported to play at the elite level in Australian Rules football and Rugby League.